Humans have not really given up on ideas of an Edenic life. Which is why they often seek to escape to paradises amidst nature whenever they get the chance. Here is a list of 15 treehouses from around the world that turn living among trees into a literally amazing experiences. 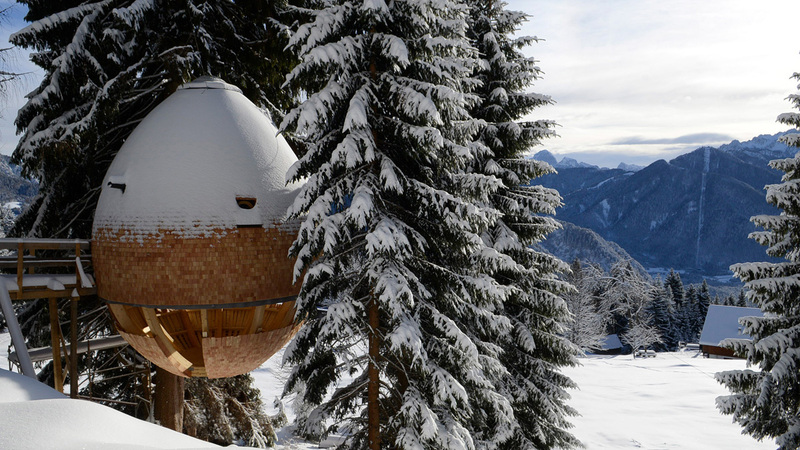 Shaped like an egg, this creation by Baumraum may make you feel like living inside a docked space capsule. 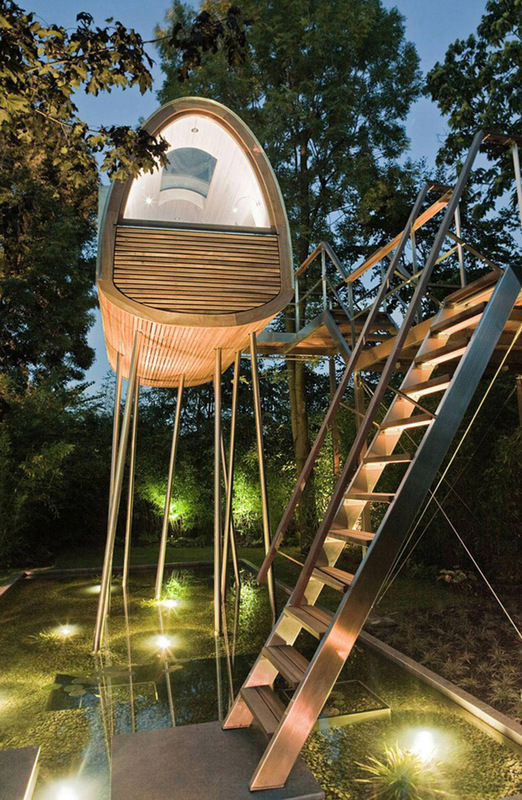 This tree house in Northern Germany can be accessed by two ship ladders separated by a lower terrace 3.8 metres high. The entry to the elevated pod is at the second deck 5.6 metres above ground. The weight of this entire structure is carried by four inclined steel supports enhanced by the connections to the trees. There are also two terraces located adjacent to the pod on the two oars. Only the roof is constructed of metal, which is zinc. The resemblance to an egg is strengthened by the elliptical windows set on a rounded glossy white front façade which provides a better view of the surroundings. To make it a really unforgettable experience, the beds are placed at the side of the windows. Check more photos. 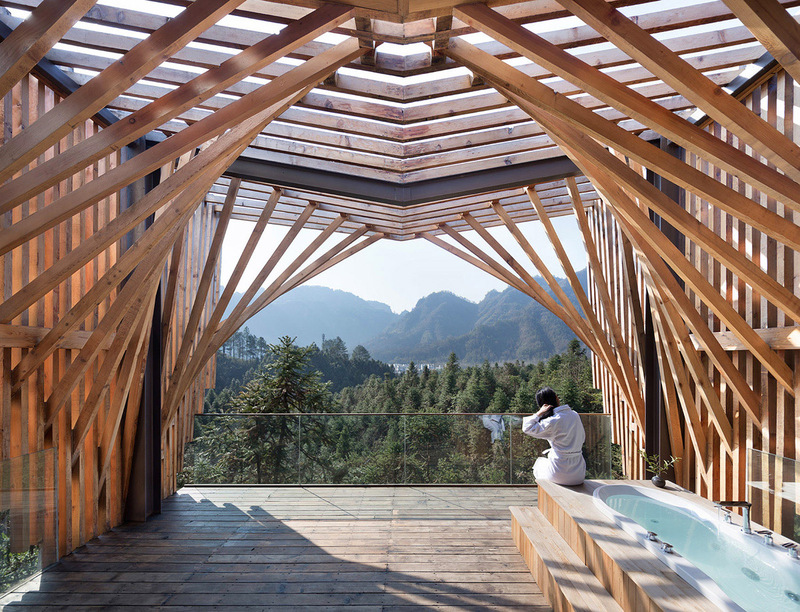 Located in Mount Qiyun in China, the Treehouse M had been designed by Andong Lu and Pingping Dou of the IanD studio. The Cambridge graduates envision this as an intimate retreat for couples who want to completely soak in the park’s natural landscape. While made of wood, it minimized the environmental impact by decreasing the total build-time. This was done by using timber and steel fittings made off-site. The materials have also been kept at their standard sizes so that the structures can be recycled. There is a lot of traditional Chinese element with a contemporary twist. It comes with its own portico, dressing room, washroom with its own bathtub and a bedroom designed as a room within a room. The 7 th Room is actually a luxury hotel in Northern Sweden just near the Arctic Circle, and it is one of the most beautiful places in the world. 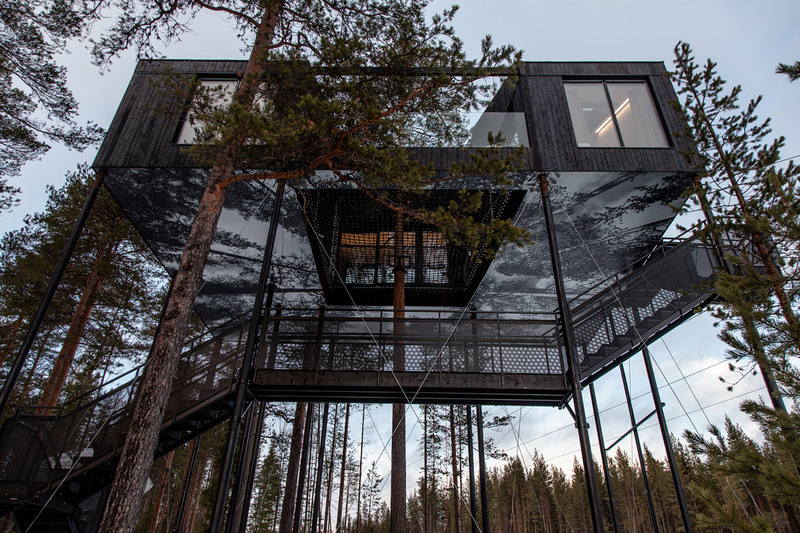 Situated 33 feet above the ground, it is supported by 12 pine columns in an isolated evergreen forest and is designed like the traditional Nordic cabin. From the large windows, you can settle in the cosiness of the light interior with your coffee and take in the marvellous views of the Swedish Lapland brightened by the winding Lule River. The biggest hit among visitors is the outdoor terrace on a netted base which allows amazing views of the Northern Lights. Check more photos. 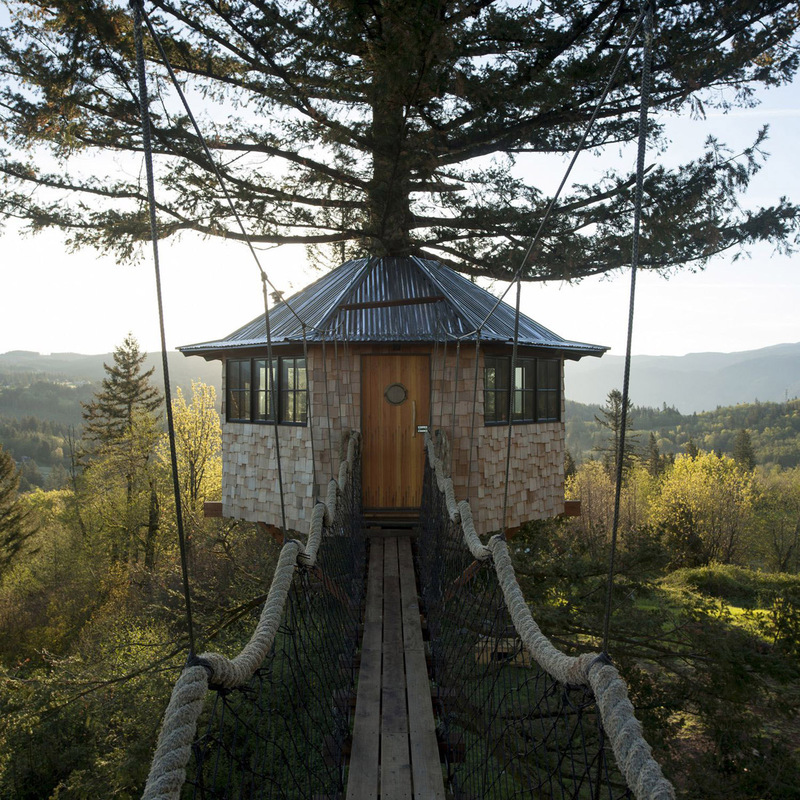 The HemLoft was designed and built by Joel Allen who left his job as a software developer to be, yes, a carpenter. It is located in the backwoods of Whistler, just beneath some of the richest mountain homes in Western Canada. Initially, there were some doubts regarding the fate of the house. Its exact location was kept secret by Allen. It was built on Crown land, and this cute little egg-shaped structure was not really liked by the rich mansion owners. It gained a new lease of life once Allen featured it in a blog and people around the world took note. It is now a feature of the Medicine Trail of the tour company Canadian Wilderness Adventures (CWA). Another offering from Canada located in a heavily forested area of the coastal region of the Vancouver Islands. 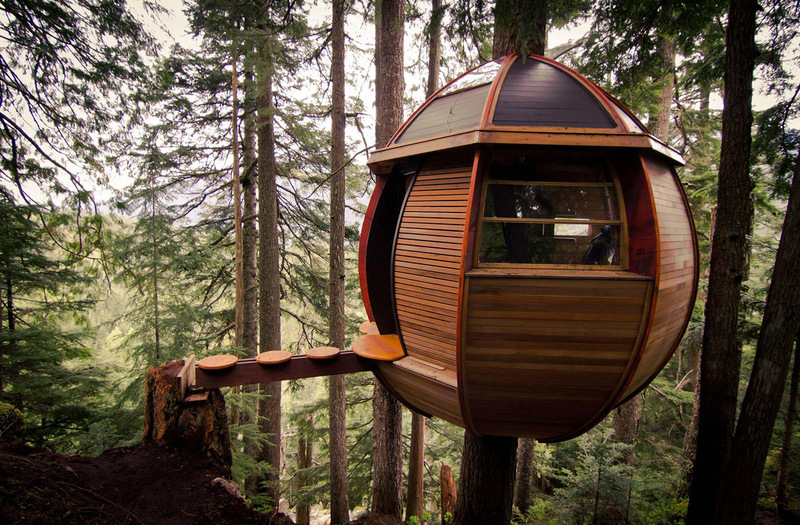 Actually, it is not one, but a collection of three spherical treehouses. One of them is 9 feet in diameter, while the rest are 10.5 feet each. These are located at a considerable height supported by the pine and fir trees. However, these spheres are just for enjoying the views and the experience. 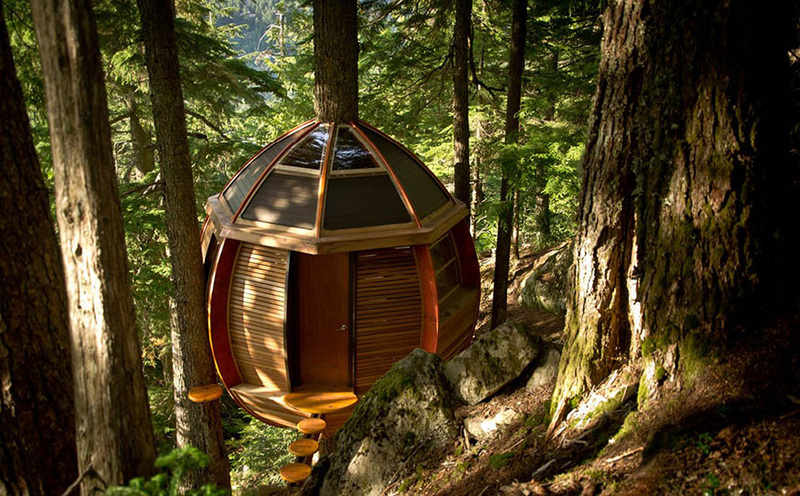 Guests can stay in the Free Spirit Spheres guest resort where there is access to a sauna just near the Qualicum Beach. Check more photos. 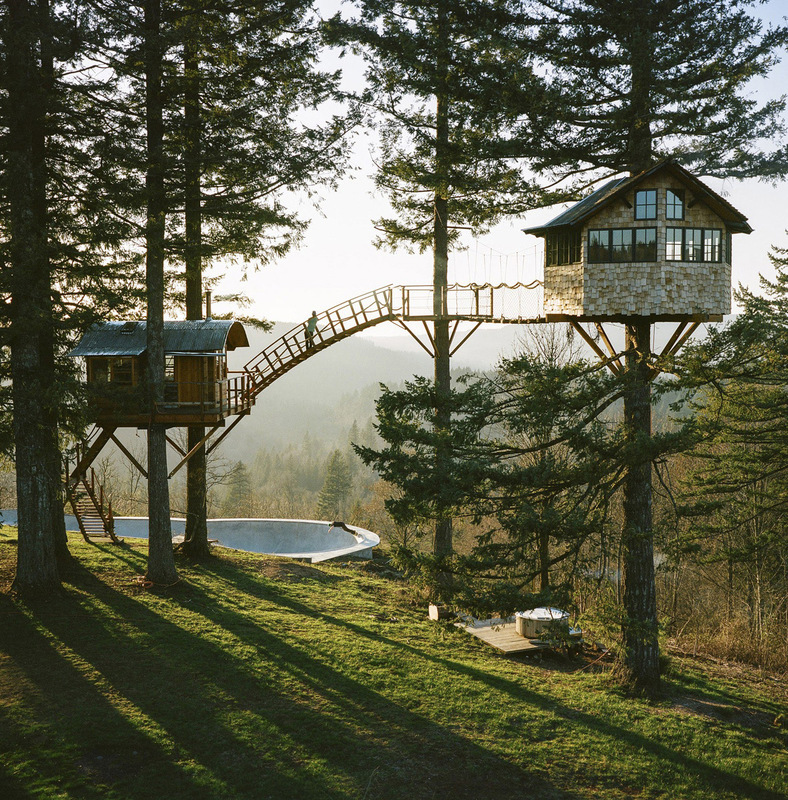 A treehouse would look like a smiling face in a country with a forest cover of 67%. And if that is not enough to show the love for nature, then you should know that this culture had its first contemporary treehouse in 1993. Takashi Kobayashi chose this name precisely because he wanted to bring to life a place where people would be one with nature. His furniture items across the 120 stores showcasing his work too are based on the same principle. 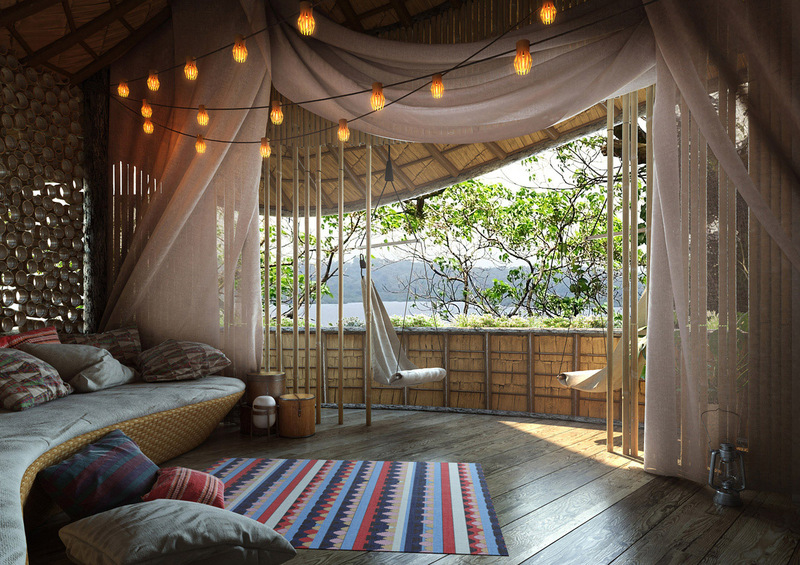 Today, this treehouse is among the most popular meeting places amidst the calm and mysterious trees. It serves as a cafe and meeting place. The biggest achievement of Kobayashi and his brilliant team is their serious effort at sustainability. 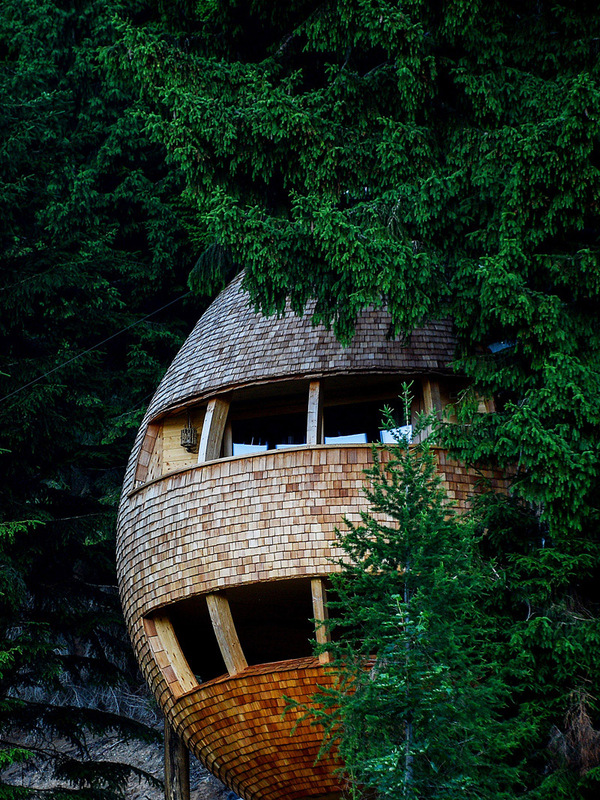 Unlike most other architects, they do not damage the tree supporting treehouses. 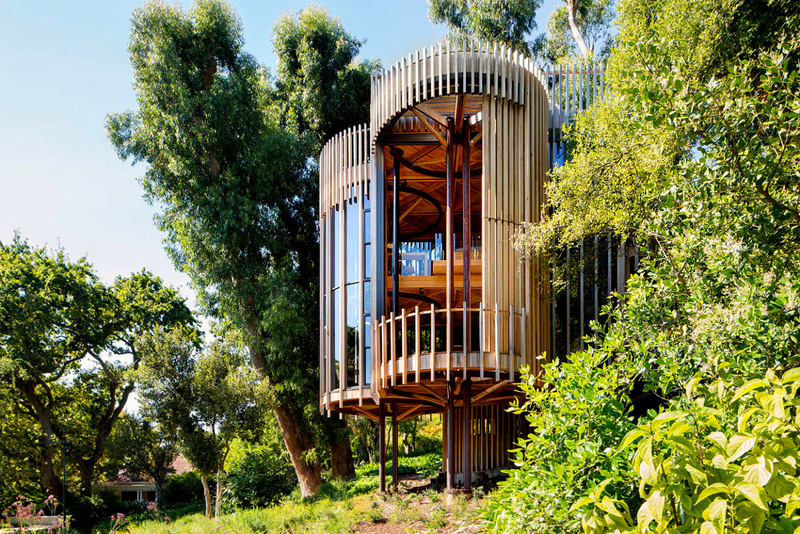 The Tree House People main purpose is to draw people’s attention to the threat to ecology brought on by unsatiated human quest for petty pleasures. The treehouse shows how to address it constructively. This is yet another piece of sheer art by the German company Baumraum. Strictly speaking, this is not a true treehouse as it relies on elevated stilts (which happen to overlook a reflecting pond) for support. 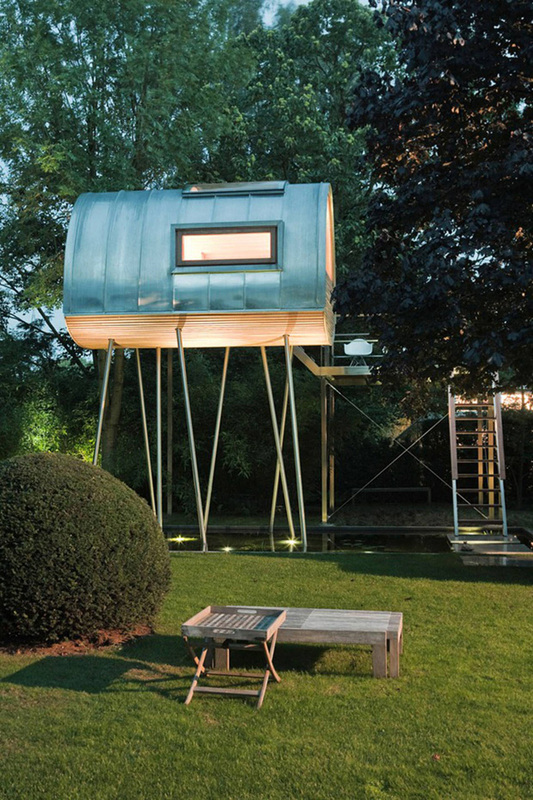 This treehouse has most of the contemporary features and has an area of 92 square feet. The 100 square fett terrace is made of tatajuba wood. The cabin can be reached through some steps and a small catwalk. The structure is located in a private backyard in Munster, a city in North Rhine-Westphalia in Germany. Check more photos. This is among the most beautiful structures in this list. It is designed by architect Claudio Beltrame, in collaboration with DomusGaia, an Italian company specializing in wooden prefabricated houses. It is located in the Italian Alps in the town of Ugovizza and is e specially suited for stargazing. It serves as a holiday home. It is shared like the pinecone native to the coniferous forests of T arvisio where the architect has his studios. Beltrame was not only inspired by the ideals of ecotourism, but also by Michel Foucault’s theories of Heterotopias (essentially spaces operating outside society and thus outside its rules). It is suspended at a height of 10 metres and supported by the surrounding fir trees. It can be accessed only by a bridge. This building project was started in 2014 in Skamania County in Washington in a valley of the Columbia River Gorge . 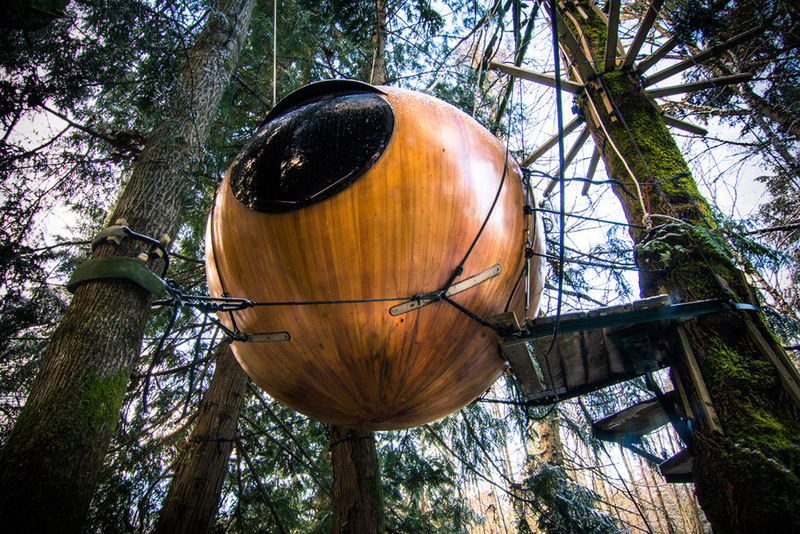 It centres on a multi-platform treehouse which includes sleeping accommodations and electricity support. It also has skating facilities, along with a wood-fired soaking tub. Those doing the construction work were from varied backgrounds, some being professional carpenters while others learning the whole process during the course of building. The brainchild of Foster Huntington, it now has an instructional book documenting the formation in order to raise funding on Kickstarter. 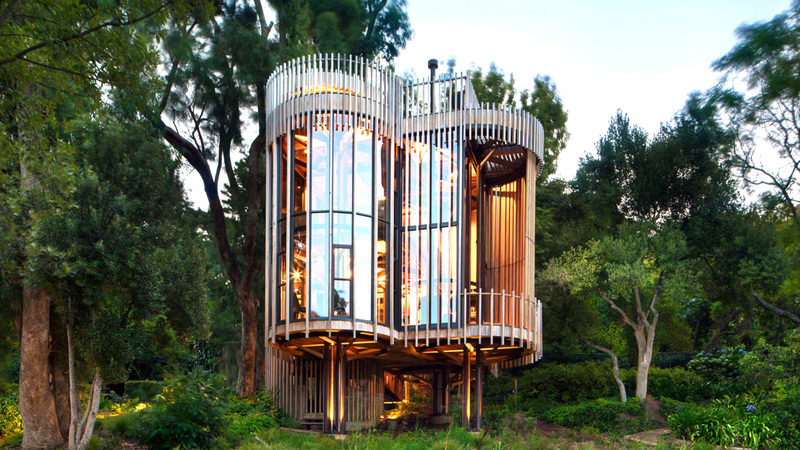 Built by Cape Town-based architectural firm Malan Vorster, this isn’t your typical treehouse. 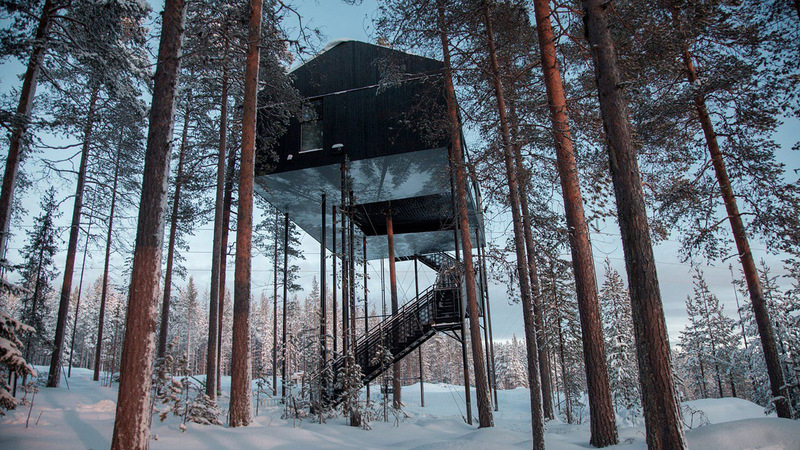 This unit of four wooden cylindrical towers is not exactly a treehouse because again, they are supported on stilts. 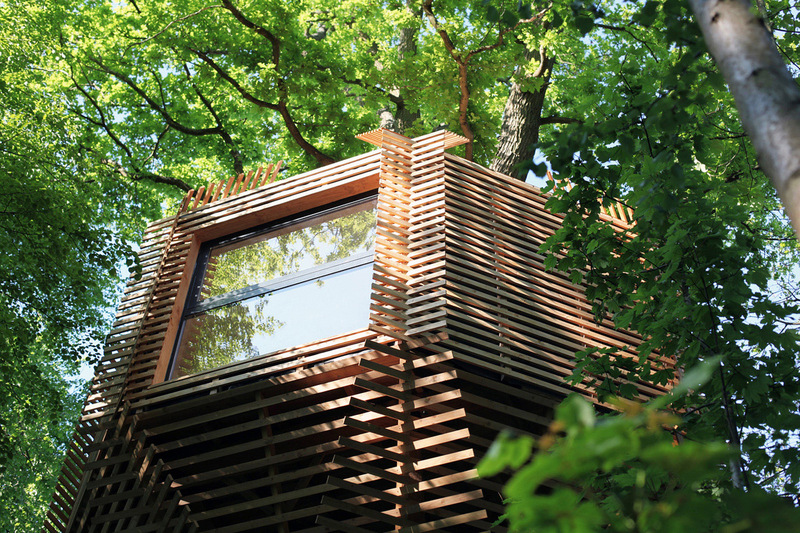 It was originally built for a resident who wanted to revisit their childhood treehouses. The glass walls are covered by red cedar battens which ensure the privacy of the residents while offering them breathtaking views. The interior has contemporary furnishing, making it nothing less than a luxury retreat. Check more photos. 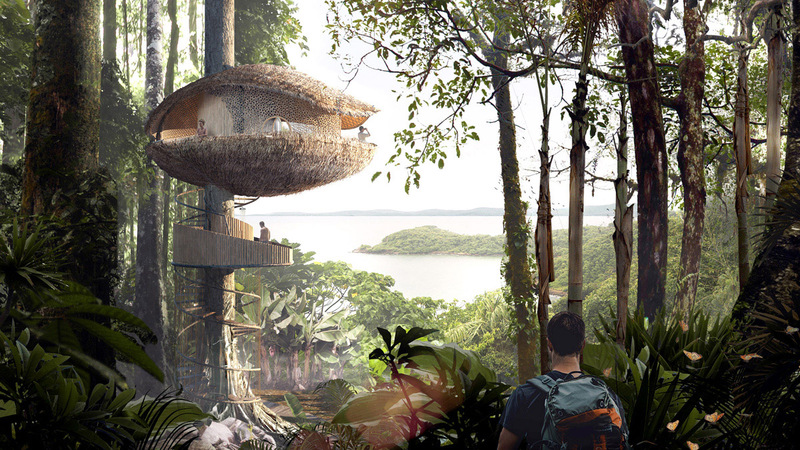 Built by London based Basa Architects for an eco-hotel in the Panama Islands, this cocoa pod- shaped treehouse can be accessed only by boat. It has been designed keeping the scenic beauty of the Caribbean islands in mind. The entrance at one side of its bulbous form splits the structure into two, giving it the appearance of a cocoa pod. The remote nature of the island contributes to the serenity as there is no risk of being drowned in a sea of tourists. It is made of bamboo using local knowledge of construction and has an area of 25 square metres. How can the French be far behind when it comes to aesthetic luxury? Having the unique shape of a bird’s nest, it is supported by a 100 years old oak tree. The small patio around the house further enhances the nest-like ambience with its feeling of protection. A platform suspended on another tall oak thirty meters away is used to access the house. As it has the shape of an octagon, offering are amazing views 360 degrees. It has a living area, a bedroom, a corridor and a dressing room. Check more photos. 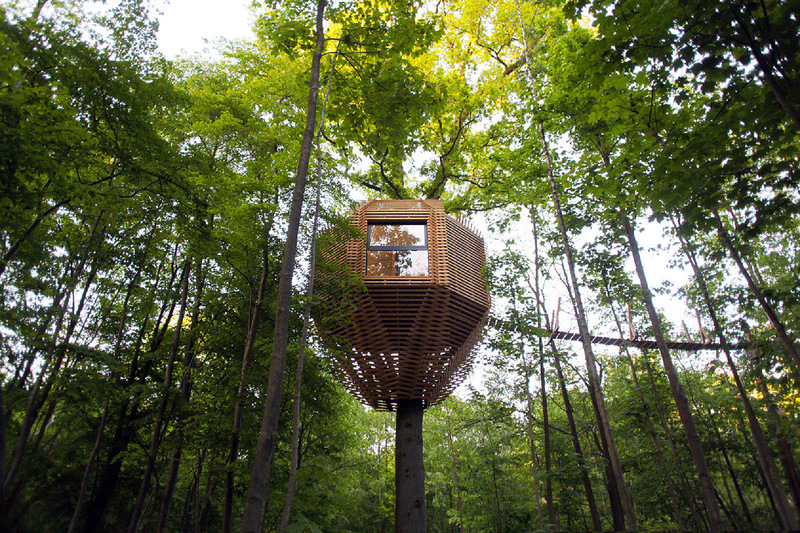 And now we have an entire hotel dedicated to treehouses. 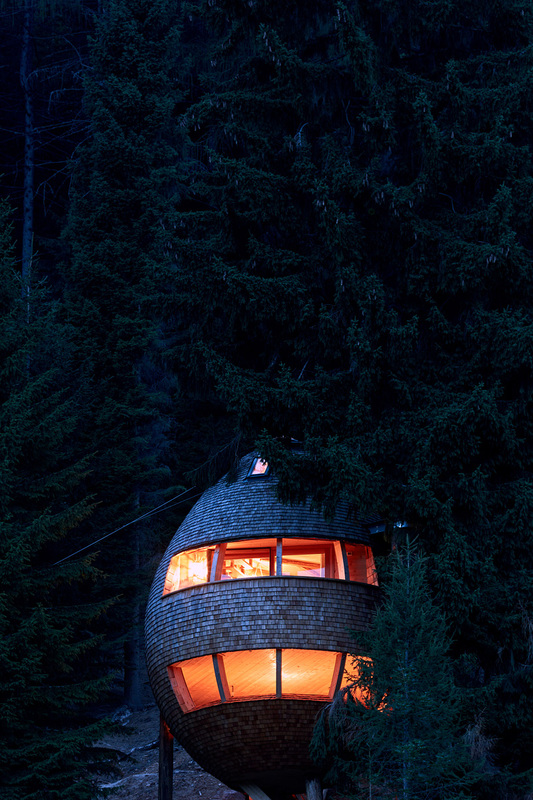 Opened by Kent Lindvall and his wife Britta in 2010, the Treehotel has contributions by seven Scandinavian architects. 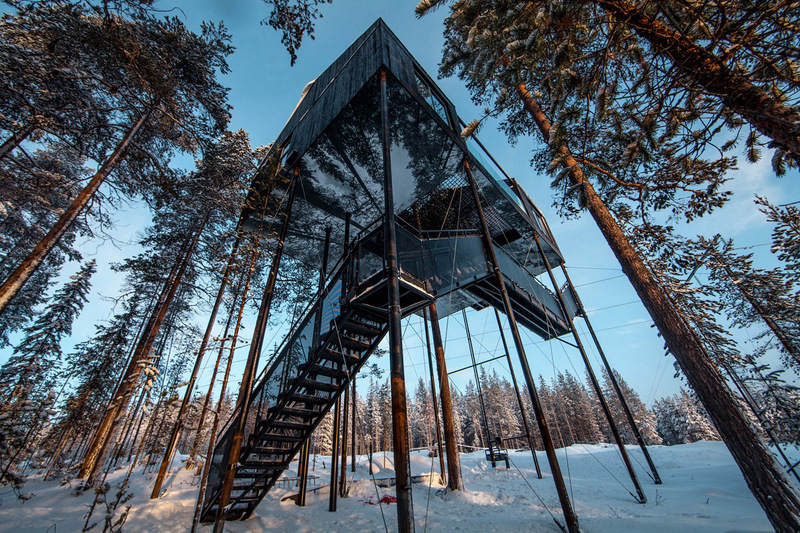 They include a mirrored cube, a bird’s nest and a charred timber cabin among others. The Lindvalls got the idea from ‘The Tree Lover’, a film by Jonas Selberg Augusten. At that time, their original traditional guesthouse business situated on the same site, was failing. Situated just north of Acapulco in Mexico, the Playa Viva takes living the green life to a whole new level. The beachfront house of 700 square feet was designed and conceptualized by D eture Culsign and completed in 6 months. This bilevel house is made of bamboo; electricity and water are provided via solar power. There is an open-air sitting room, along with an outdoor shower facility in one part of its bathroom. There is a wonderful view of the beach from the bed in the sleeping room. Need we say more? Check more photos. 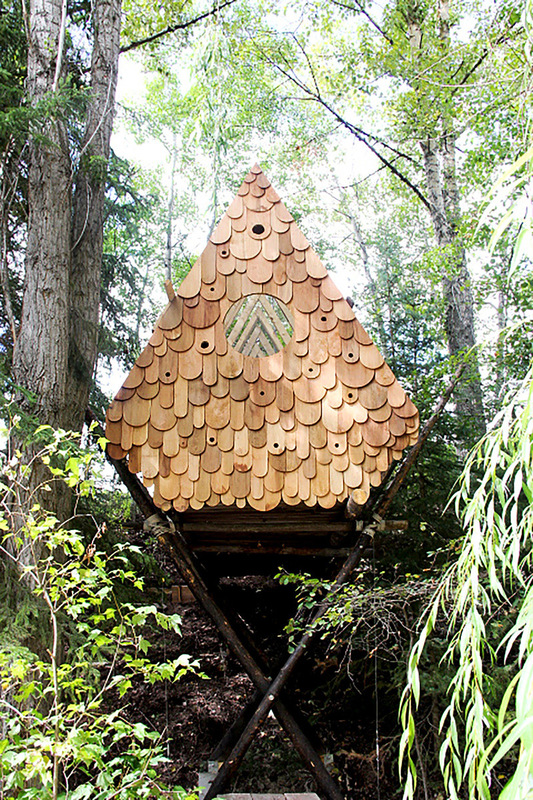 Located in British Columbia, this not only invites humans but also birds. It comes in an A-frame and is situated in the forest slopes of the small village of Windermere in the Columbia Valley of Western Canada. It is 9 feet above ground level and is supported by wooden stilts. 20 feet high, it blends in beautifully with the trees. It occupies an area of 100 square feet. Apart from supporting two people at a time, it is also available for free for 12 species of birds with their specific nesting facilities , or any other creature who drops in for a stay for that matter. Beautiful, aren’t they? The best thing is, you can have a far greater experience compared to busy luxury urban hotels at very cheap rates. So next time you are looking for some peace, give these places a thought.